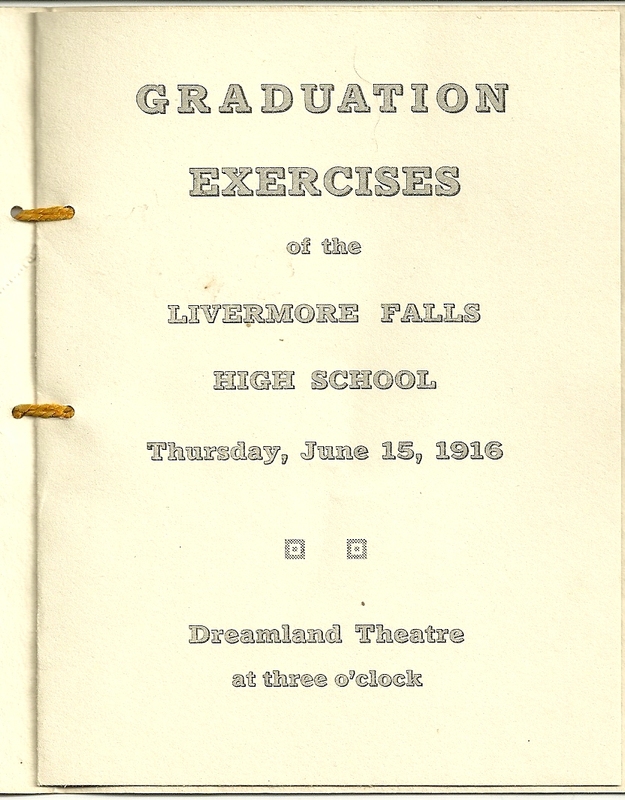 1916 Program for Graduation Exercises at Livermore Falls High School, Livermore Falls, Maine. Livermore Falls, once known as East Livermore, is a town in Androscoggin County. The official town website has a page with a brief history of the area. 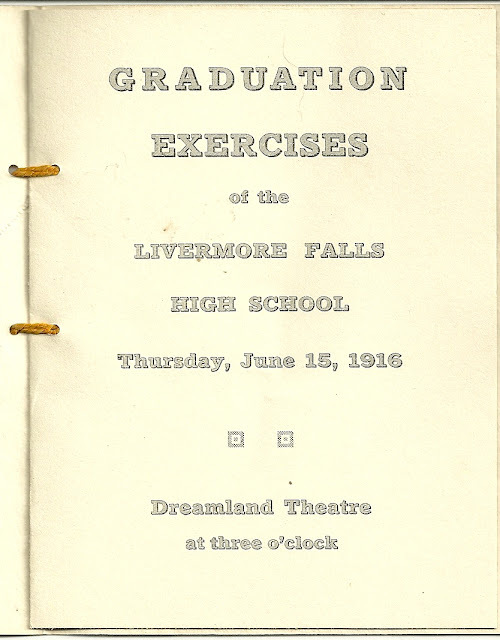 Myrtle May Sawyer, Class Salutatorian, was born in May of 1898 at Livermore Falls, Maine, the daughter of Angus Thomas Sawyer, born in New Brunswick, Canada, and Gertrude May (Conant) Sawyer, born in North Livermore, Maine. Her paternal grandparents were Thomas and Domitille (Hebert) Sawyer. Her maternal grandparents were William Henry Conant and Georgia Etta (Oldham) Conant. Myrtle was teaching in the Cape Elizabeth, Maine area when she married Nathan Howard Sullivan of Portland on 13 October 1919. He was the son of John W. Sullivan Jr. and Margaret E. (Kilday) Sullivan. Myrtle and Nathan Sulivan raised their family in Portland. Leafy May Whynaught, who read the Class History, was born 17 June 1897 at Livermore Falls, Maine, the daughter of Nova Scotians Artemas William "Arthur" Whynaught and his wife Josephine Dora (Lohnes) Whynaught. Her paternal grandparents were Peter and, I think, Mary Elizabeth (Wagner) Whynaught or Weinacht or variant spelling. Her maternal grandparents were Abel and Mary E. (Penny) Lohnes. Leafy's family lines go back to early German immigration into Nova Scotia. On 28 August 1928 at Boston, Massachusetts, Leafy married George Glenn Wallick, who was born 5 September 1890 at Sturgis, Michigan, the son of George Washington Wallick and Cinderella (Keplinger) Wallick. The couple lived in Michigan and Massachusetts and raised, I think, two children. 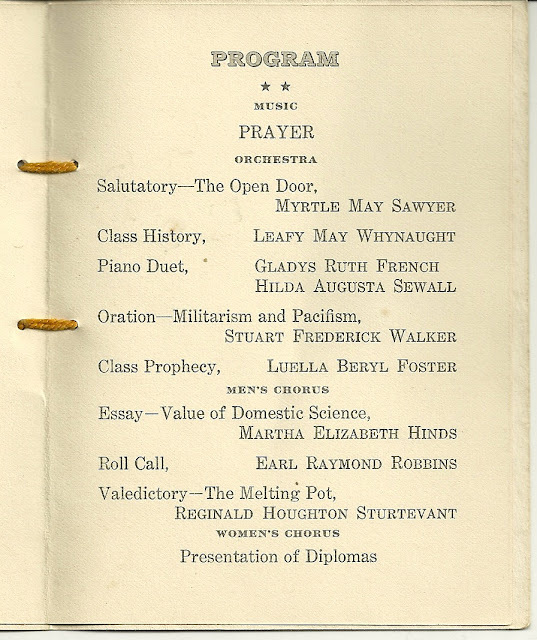 Gladys Ruth French, who played a piano duet at her graduation ceremony, was born 30 May 1897 at Jay, Maine, the daughter of Fred Guy French and Ida May (Latham) French. Her paternal grandparents were Benjamin W. and Almira (Graffam) French. Her maternal grandparents were George and Martha Ada (Bean) Latham. She married Harold William Jennings, who was born 14 January in Leeds, Maine, the son of William and Hannah (Adams) Jennings. His paternal grandparents were Howard L. and Julia E. (Maine) Jennings. His maternal grandparents were Samuel W. and Ellen Florinda (Crockett) Adams. Gladys and Harold William Jennings lived in Massachusetts and had at least one daughter. Hilda Augusta Sewall, who was the other half of the piano duet, was born 8 March 1898 at Est Livermore, Maine, the daughter of Samuel Mark (birthname White) Sewall and Adelaide E. (Wilkins) Sewall. Her paternal grandparents were Columbus and Pathenia R. (Jones) White. Her maternal grandparents were Augustine and Josephine (Farrell) Wilkins. She married Herbert David Norton, who was born 3 April 1900 at Temple, Maine, the son of Charles A. and Elizabeth A. "Lizzie" (Crosby) Norton. His paternal grandparents were Samuel R. and Mary N. (Tripp) Norton. Her maternal grandparents were, I think, Lureman and Laura M. (Huff) Crosby. Hilda and Herbert David Norton raised a family of at least two children in central Maine. Stuart Frederick Walker, who gave an oration on Militarism and Pacifism, was born 16 August 1899 at East Livermore, the son of Henry F. Walker and Nellie, whose maiden name on Stuart's birth record I haven't yet been able to decipher. She was born in Orono, Maine, and her maiden name could possibly be Criner or Cronin. Stuart's paternal grandparents were Alonso [or Alonzo] and Mercy(Dyer) Walker. After graduation from Livermore Falls High School, Stuart majored in Economics at the University of Maine at Orono. I found him in the 1930 Census at Lancaster, Pennsylvania, living alone and working as a bond salesman. In the Maine Marriages database, there are two marriages for a Stuart F. Walker, but I don't know if I have the correct Stuart for either case. The women are Alice M. Nichols, who was married 20 November 1926, and Glenys H. Clement (later Voter), who was married 4 December 1930. Luella Beryl Foster, who read the Class Prophecy, was born 17 March 1899 at East Livermore, the daughter of James Leon Foster and Vesta R. (Perkins) Foster, who were born in Gray, Maine, and Weld, Maine, respectively, according to Luella Beryl's birth record. Her paternal grandparents were James Nash Foster and Dorcas Elizabeth (Foster) Foster. Her maternal grandparents were Nathan and Betsey Perkins. On 18 October 1919, Luella Beryl Foster married Gardner A. French, the son of Walter A. and Georgina (Gould) French. He was born in July of 1893 at Lewiston. His mother was a graduate of Bates College there. His paternal grandparents were, I believe, Alvin G. and Ellen (Taylor) French. His maternal grandparents were Welcome Beals Gould and Amanda Betsey (Brown) Gould. Luella Beryl (Foster) French and her husband Gardner A. French lived at Livermore Falls, Maine and had at least one child, a son. Martha Elizabeth Hinds, who gave the essay on Domestic Science, was born 7 December 1898 at East Livermore, Maine, the daughter of Raphael A. "Ralph" Hinds and Mary J. (Cummings) Hinds. Her paternal grandparents were Winthrop Tisdale Hinds and Sarah L. (Allen) Hinds. Her maternal grandparents were Jonathan Millett Cummings, known as "Millett", and Mary J. (Merrill) Cummings. 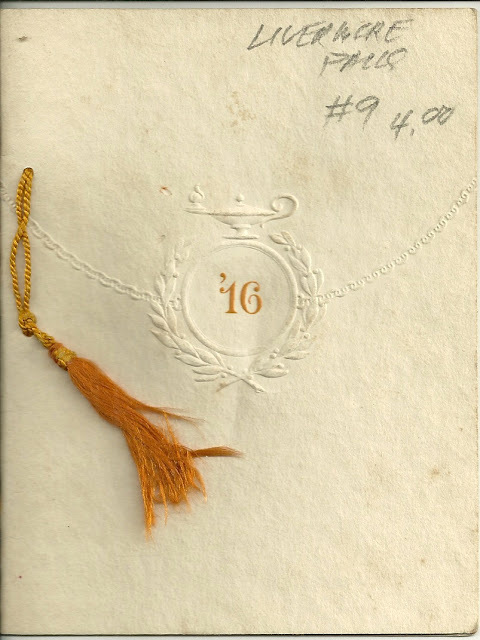 Sadly, Martha Elizabeth Hinds died at Fairfield, Maine on 12 December 1918, possibly from the Spanish Flu. Her death record listed her as a student. Reginald Houghton Sturtevant, Class Valedictorian, was born 26 May 1899 at Livermore Falls, Maine, the son of Chester Houghton Sturtevant and Charlotte Lincoln (Ham) Sturtevant. His paternal grandparents were Josiah Houghton Sturtevant and Helen Elizabeth (Ormsby) Sturtevant. His maternal grandparents were Joseph Gardiner Ham and Mary Emma (Chandler) Ham. On 15 Oct 1927, Reginald Houghton Sturtevant married Laura Arlene Wing. She was born 22 February 1909 at Farmington, Maine, the daughter of Walter Wellington Wing and Harriet A. (Keith) Wing. Her paternal grandparents were Augustus G. Wing and Eunice W. (Ryerson) Wing. Her maternal grandparents were Linton Joseph and Laura J. (Goodrich) Keith. Reginald and Laura lived at Livermore Falls and raised a family of at least one child, a son. Reginald worked in banking. If you have any corrections, additions or insights regarding the above information, please leave a comment or contact me directly. Thanks! Earl Raymond Robbin's grandmother was, in fact, Margaret Haskell Robbins. She died on 27 Jan 1874 in Chelsea,Maine. This date is clearly inscribed on a large Robbins monument in Chelsea Heights Cemetery. Also, the death return for Clarence Robbins (d. 9 Aug 1935 in LIvermore Falls) lists his mother as Marguerite Haskell; the informant was Clarence's brother, John Robbins. Margaret Haskell was the daughter of Joseph Haskell and Margaret Stoddard, who are also buried in Chelsea Heights Cemetery. Joseph Haskell was born Joseph Haskins, probably in Middleboro,MA. Joseph Haskins, his father Abner Haskins, and his three brothers began using the name Haskell around 1825 in Belgrade,Maine. Abner Haskins/Haskell and his wife Robe "Ruby" Burden are also buried in Chelsea Heights Cemetery. Thank you for your comment. I've updated the information on Earl Raymond Robbins as a result, see above. If you have any other information to share, it would be most appreciated.